The Hanged Man shows a man suspended from a T-shaped cross made of living wood. He is hanging upside-down, viewing the world from a completely different perspective, and his facial expression is calm and serene, suggesting that he is in this hanging position by his own choice. He has a halo around his head, symbolising new insight, awareness and enlightenment. His right foot is bound to the tree, but his left foot remains free, bent at the knee and tucked in behind his right leg. His arms are bent, with hands held behind his back, forming an inverted triangle. The man is wearing red pants representing human passion and the physical body, and a blue vest for knowledge. The Hanged Man is the card of ultimate surrender, of being suspended in time and of martyrdom and sacrifice to the greater good. The Hanged Man reminds you that sometimes you have to put everything on hold before you can take the next step, or the Universe will do it on your behalf (and it may not always be at the most convenient time!). You may have heard the saying, ‘What got you here won’t get you there’, and that indeed is at play in this card. The Hanged Man calls you to release the old mental models and behavioural patterns that no longer serve you so you can see your world from a new perspective and embrace new opportunities that would have otherwise been hidden from you if you didn’t hit the brakes. Here’s the thing. These ‘pauses’ can be voluntary or involuntary. 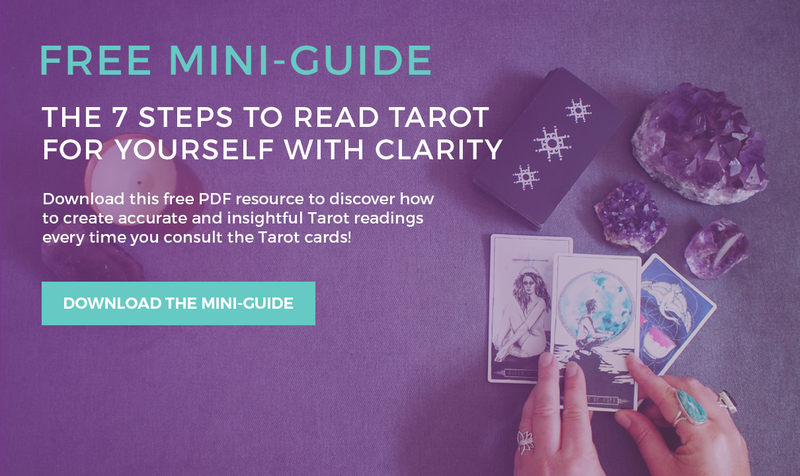 If you’re in tune with your intuition, you’ll start to have a sense for when it’s time to hit the brakes and put things on hold – before things get out of hand. But if you’re out of alignment and oblivious to those intuitive signs, the Universe will probably put things on hold for you, in the form of continued obstacles, ill-health, and breakdowns. When you sense the ‘pause’ coming, pay attention to it; otherwise the Universe will turn up the volume until you can’t ignore it any longer. When the Hanged Man appears in a Tarot reading, your projects and activities may be coming to an unexpected and abrupt halt. Don’t keep pushing forward, hoping that more force will drive you to where you want to go. Instead, surrender to the opportunity to pause and view it as your chance to reassess and re-evaluate where you are on your path. Something new is emerging, and you won’t be able to see it unless you allow the time and space for it to come through. The Hanged Man is your invitation to welcome these ‘pauses’ with open arms and surrender to the ‘what is’ – even if it is different from what you expected. Take time away from your routine to connect with a new way of thinking and seeing. Sure, you might have to put important projects on hold while you do this (and it might be super inconvenient) but trust me, it’ll be worth it. This is the Universe’s way of helping you see new perspectives and preparing you for the next uplevelling that is happening in your life. If you push or resist, you will meet more obstacles along the way; instead, ‘allow’ the opportunities to flow smoothly and effortlessly to you. 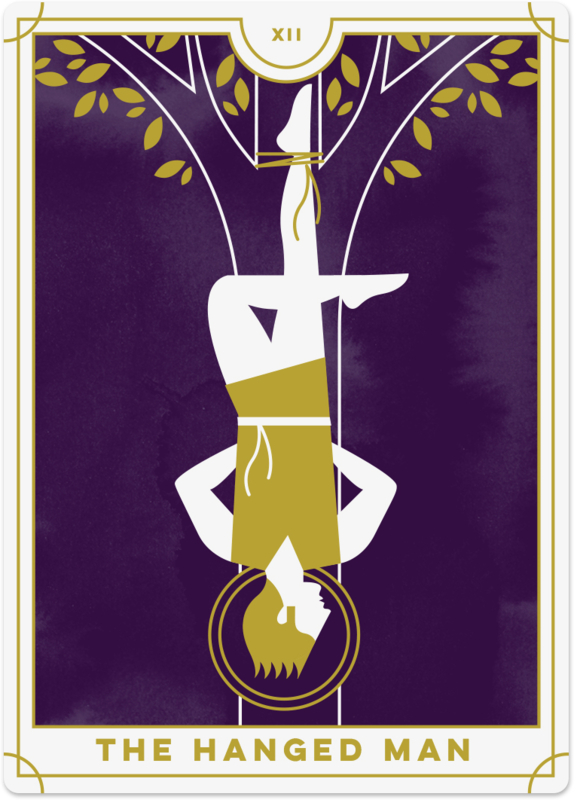 The Hanged Man can sometimes reflect that you are feeling stuck or restricted in your life. What is holding you in this ‘stuck’ position? What is preventing you from moving forward? On one level, the Hanged Man is asking you to surrender and let go. Instead of investing in specific outcomes or resisting your current circumstances, accept them and allow yourself to flow with life. On another level, you are being called to change your perspective and shift your energy and may find that separating yourself from your everyday life is helpful, whether it’s going for a walk in nature, going on a retreat or moving to a new country. Change up your routine so you can start to shift your energy and flow more freely again. The upright Hanged Man encourages you to pause for a moment and see things from a different perspective. Reversed, this card can show that you know you need to hit the pause button, but you are resisting it. Instead, you fill your days with tasks and projects, keeping busy and distracting yourself from the actual issue that needs your attention. Your spirit and body are asking you to slow down, but your mind keeps racing. Stop and rest before it’s too late. The Universe will only dial up the volume if you ignore it, and as a result, you may end up crashing. So, as soon as you hear the call, clear your schedule and make the space so you can tune in and listen. You may already be in a position where everything has been put on hold, much to your frustration. The reversal of the Hanged Man can indicate a time when you’re getting blocked, stuck or restricted because other people or other circumstances have left you on hold. While you feel resistant, it’s important that you surrender to ‘what is’ and let go of your attachment to how things should be. Be in flow with life, even if it’s not as you expected it (seriously, when does it ever go exactly as you expected!? ), and loosen your grip. If your life has already been on pause for a period, the reversed Hanged Man may come as a positive sign that you can now move forward with a new perspective and a renewed sense of energy. You may find that events line up with more ease and flow, and you’re ready to go again. There may have been a break-through or stark realisation about how you need to do things differently. You’re prepared to make those changes and move ahead with a new mindset. In a reading where a relationship is on hold, the Hanged Man reversed suggests that you are content to wait around… to a point. You realise that this relationship will evolve and, due to its complexities, you cannot rush it. However, you also do not want to wait forever, and you acknowledge that there will come a time when you must decide. The reversed Hanged Man can also signal that you are stalling a decision or action. You may think you’re waiting until you feel 100% ready – but guess what? You’re probably never going to be 100% ready. So, what are you waiting for? Take the leap! Make that decision! Do it before the Universe decides it can’t wait for you.